Home > Dogs & Cats > Frequently Asked Questions [FAQ] > How Do I Use Flea & Tick for Pets + Home Natural Flea Spray? Flea & Tick for Pets + Home is Wondercide’s natural flea and tick control, naturally formulated for use on pets and interiors. It is safe for use on puppies, kittens, pregnant and nursing mothers, and seniors. Flea & Tick for Pets + Home offers pest prevention and treatment in one safe, effective spray. This spray kills pests like fleas and ticks and prevents them from hitching a ride on you or your pet when you go on walks or to the park. It kills stages of the insect life cycle: eggs, larva, and adults. Other natural and conventional pesticides don’t, which is a very important distinction. Flea & Tick for Pets + Home also stops itching and scratching, comforts dry skin, leaves pet coats shiny, and eliminates mange. It does not stain pets, furniture, or flooring. Our recommendations for how to use the spray vary, based on whether you’re using it to treat an active flea and tick problem or prevent one. 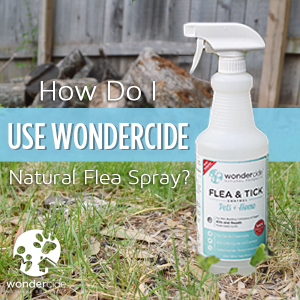 How often should I apply Wondercide’s natural flea spray to my pets? Generally, we recommend applying every 2 to 3 days for pest prevention, or as needed to kill and repel fleas, ticks, and mosquitoes in your local area. It’s safe for everyday use. However, if you’re using Flea & Tick for Pets + Home to treat an active flea or tick population, we recommend applying to your pet/s daily (if needed) and treating your environment (home and lawn). It’s best to apply Flea & Tick for Pets + Home frequently if you can’t control the outside environment your pet walks or plays in. Examples of an uncontrollable environment include apartment complexes (you can’t treat the entire apartment complex grounds! ), dog parks, the pet groomer, or homes on large plots of land (treating five or six acres usually isn’t affordable or effective). We recommend applying Flea & Tick for Pets + Home before or after your pet enters each of these uncontrollable environments. If you don’t want to apply the natural flea spray every day, or you start seeing fleas or ticks on your pet within a day of applying Flea & Tick for Pets + Home (this suggests a larger pest problem), we recommend treating the environment (your home), in addition to your pet. Use the same solution (we sell bigger bottles!) to kill fleas or ticks in your home, then use Flea & Tick for Yard + Garden to treat your yard, garden, and any outdoor pet play areas. Again, this answer depends on whether you’re using Flea & Tick for Pets + Home to treat an active pest population, or to prevent future pests from appearing. Flea & Tick for Pets + Home provides a contact kill, so any pests sprayed with the product will die within 1 to 2 minutes. Because pets are active animals who generally go outside or into uncontrolled environments every few days, Flea & Tick for Pets + Home is most effective when applied every 2 to 3 days as pest prevention. This ensures fleas, ticks and mosquitoes are continuously repelled and any pests that may hitch a ride on your pet are killed within two to three days. When you have an active pest population or an infestation, fleas and ticks tend to move from one area to another (say, from indoors to outdoors, or the living room to the kitchen), and may reattach themselves to your pet every time he or she enters an infested area. For every flea or tick you see with your naked eye, there are 95% more in the egg, larvae and pupae stages spread throughout the home. Without treatment, these egg, larvae, and pupae stages will hatch into more adult fleas or ticks. To prevent these insects from hatching, and to kill the adult insect population, we recommend treating the pet first, then your home, and then the lawn or garden (when applicable). Treating the lawn twice within a 7 to 10 day period will help to ensure the outdoor problem is eliminated. In most cases, only 1 indoor home treatment is required, if you apply full coverage (one gallon per 1,500 square feet). For information on using Wondercide products with topical flea and tick control (spot drops), please click here. For product ingredient and safety information, click here. Just tried it today for the first time. took the pets outdoors and sprayed them. next we sprayed the pets bedding and the rugs where they mostly lay down. MY CARBON MONOXIDE DETECTOR WENT BERSERK AND SO DID MY SMOKE ALARMS. Don’t know why this happened but it sure is annoying. I don’t mind the strong cedar smell but my alarms don’t like it. Strange that you have this issue. I just moved into a house and I replaced all the smoke alarms and put in a brand new carbon monoxide detector and I’ve sprayed my entire house down 3 times since and no problems. In fact my C02 detector has a digital display of the current reading and I just sprayed around it and it still reads 0. I’m curious, are all your sensors linked? It’s common practice to have them all tied together so if one goes off they all go off to ensure you hear the alarm. But this also has a bad side effect, if one is bad and gives a false alarm, they all go off with the same false alarm. Smoke detectors work by leaking a small amount of radiation and then they detect how much radiation is in the surrounding area. Smoke displaces the radiation and thus triggers the alarm. However, an old alarm would potentially have material that is going inert and not putting out enough radiation (although it already puts out very little). While the fragrance shouldn’t displace it, it’s possible that it can displace enough to trigger an old detector. It’s also possible the CO2 detector is going bad. Although I’m not familiar with how those work or if they really can go bad. Thanks Jason! We have had this feedback one other time (in 5 years) and it was a fogging application at a multi-family building in NY. The case there was as you described, the alarm was old. The complex manager replaced it and they continue to use Wondercide BioDefense on a quarterly basis to protect their property and tenants from pests (roaches & bed bugs primarily). Helene, we are sorry to hear you had this experience and hope things are better now. We reached out to you by email to check in, so please let us know how things are going with your treatment and if you have identified the potential cause (old alarms, new alarms, linked system, application method, etc) so we can help others accordingly. I show my terrier. He has a rough coat. Will this product soften his coat? Great question. We do hear from people that Evolv improves their dogs coats. Since every dog and fur type is different, we would suggest using the product on your Norfolk at a time when you don’t have a show. If after a few days you feel the coat is softer than it should be, you can simply wash off. It will not affect the coat for an extended period of time unless it is used routinely. I can’t wait for the product to get home. I have a rescued Siberian Husky and he has fleas. The infestation got so out of control (first time in 6 years since we got him) that we ended up shaving him. I feel horrible about it, huskies are not supposed to be shave, they really need their coat for protection especially in the Miami heat. But nothing worked, we did the dipping at the Vet and use the drops and still they were crawling all over him. So far we spent more than $ 300.00 and eventhou he is shave I’m afraid they are not all gone 🙁 Hope your product works and my baby is back to been himself !! It’s not ideal for Huskies to be shaved, but since it is early spring (not too hot yet) he should be fine. Luna, our founders dog, is an Akita Husky mix and she was shaved a few times over the years living in Texas (hot like Miami). Just be careful of potential sunburn. There are some natural and safe sunscreens for dogs out there if you need to go that route. With respect to the fleas, we highly recommend treating the home and lawn “environment” to eliminate the fleas and life cycle at the source. Treating the dog with EVOLV will kill the fleas (and eggs, larvae, pupae) on the dog and bedding, but with the problem you are having, getting control of the “source” of the problem is key. 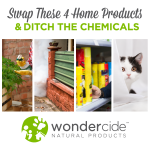 Try Wondercide BioDefense to treat the home and EcoTreat for the lawn. You will have this under control in no time! With an active flea population, if you just treat the dog it will be an ongoing battle. We refer to this as the 3 step system: pet, home,and lawn. Let us know if you have any questions! i got evolv for myself. we live in the country and when i am workingoutside i get ticks on my body. most of the comments i have read are fot pets? So glad to hear you found Evolv to help repel ticks when you’re working outside! Though this product is labeled for use on pets, it is safe and effective for use on humans, as well. There is no harm in using it to protect both you and your pets from ticks, fleas, mosquitoes, and hundreds of other pests. Please let us know if we can help in any other way! Hi. I am curious how it cures mange as I have one dog with a compromised immune system that is suffering with demodetic mange right now. Thank you! Hi Terri! Thanks so much for stopping by our blog! So sorry to hear your little one is suffering from mange. Mange is a skin disease caused by parasitic mites. Evolv effectively kills the mites and helps to restore skin health without impacting the animal’s immune system. Used in combination with our Skin Tonic Spray or Oil, customers have seen complete elimination of mange and restoration of coat and skin. We’d also recommend adding Neem Bark Powder to your regimen to naturally boost the immune system. We hope this helps and hope your furry friend starts feeling 100% soon! O my goodness you have no idea how happy i am that i found you ,..i was surfing for something and just “came across” your site.. i wish so bad i would have known about you guys when we lived in TN for 17 years.. so many of our “babies died from fleas .. we lived in a log home with our cats dogs and birds and we just couldn’t keep up with the flea population….but we do have a lot of ticks up here,in fact i have lyme disease and so does one of the babies a 12 year old cocker spaniel.. we have 5 dogs and 8 cats and 5 birds..We have a mite problem..the cats keep scratching their ears up where i have a room full of plants.. can i safely spray this on my plants ?if i spray the house will the spray bother my birds? Thank you for such a wonderful product !! we love our babies and will ALWAYS have pets so we will be loyal customers!! Please always make this product!1 I cant wait to get mine.. i ordered some oil for their ears and i think some evolv? and something to spray on their skin.. and i think 32 oz of a spray for the carpets for the mites.. thankyou again!!! love you guys!!! Does the evolv natural flea spray ever expire? Thanks for your question, Krista. Just so you know in case you’re looking on our site, Evolv has a new name: Flea & Tick Control for Pets + Home. The spray has a shelf life of 3 years. Hope that helps! I have a puppy with demodectic mange and I am trying to avoid high dose of ivermectin my vet recommended. 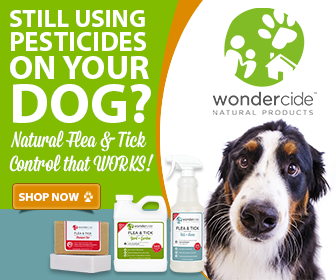 I have had really great results preventing fleas and ticks with your products and I was just wondering how I would use wondercide against the mange? How often should I apply it? Hi Kate, Wondercide Flea & Tick Control for Pets + Home kills mites, which are the cause of mange, so it can also be used to get rid of mange in lieu of the ivermectin. You can use Pets + Home daily until the problem is resolved. Wondercide Skin Tonic Spray would also be useful in soothing the skin and wiping out bacteria as the mites are eliminated. Hope that helps! If you have further questions, please reach out to the PAWSitive Experience Team at 877-896-7426 or service@wondercide.com. I just wanted to say I am so happy with Wondercide tonight. I adopted two 12 week old kittens today, and when I brought them home from the shelter/vet, my daughter noticed the tell tale dirt on the light colored one. Fleas. Not surprising, but not what you want to find on your children’s new pets. I had treated the house and my adult cat earlier in the fall after another shelter adopted dog brought us fleas even though he was on a flea preventative pill. I am so glad I had some Wondercide left over. It is amazing how it kills the little buggers on contact. After rubbing them both down, it was easy to pick off the dying and dead fleas. So happy to nip it in the bud. Hoping to prevent a whole house infestation again. The kittens don’t love it, but they don’t seem to be having any ill effects. How often should I/can I reapply it? I am planning on doing a nightly flea check/comb and wondercide treatment until I don’t see any more. What should I do the next several days and weeks? Right now they are quarantined from my other cat while they wait for their 2nd round of vaccinations and make sure their fleas are gone. Thanks for an effective, natural alternative to pesticides. Happy Monday! We hope that you had a great weekend and that your week is off to a great start! Thank you so much for your kind words and continued support of Wondercide. Congrats on your recent adoption; those kittens sure are lucky! You are right: you definitely want to get rid of those few fleas before it becomes a huge problem, which can happen pretty fast. 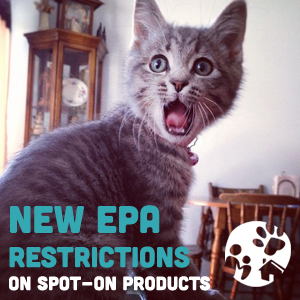 Flea and Tick for Pets + Home is safe to use on kittens. Since they are more sensitive, we do recommend doing a test spray on the back of the neck about 8 hours prior to a full application, this will help to test for any allergies or sensitivities. Once you have done the test, you would want to do an all over body mist, making sure that you do not over saturate. What a lot of our cat parents like to do is spray the solution onto their hands and then use their hands to apply it to the fur. This is a great way to evenly coat them and avoid over-saturation. We typically recommend applying it every 2-3 days, but it is safe to use on a daily basis. You could also use Pets + Home to spray bedding or the areas in your home where your new kittens hang out. It would be a good idea to comb them after you sprayed them so that you can remove the dead fleas and flea dirt. Hope this helps! Hi, for the first time this year my 7 year old retrieve is full of ticks and so is my house! I am using Wondercide in open areas and it does kill ticks. But I need more information on how often I need to apply Wondercide, do I need to move the furnature and big rugs? How often do I spray my house? My dog was using Wondercide, I took her to the Vets and she applied some flea and tick medication because it was a massive infestation on the dog. 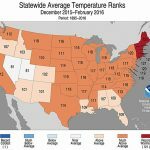 Please give me more information how to treat my house and is it safe to breathe or do I need to leave the house for a few hours. I live in a big grassy area with miles of desert and the dog runs free. I’m sorry to hear about those pesky ticks on your Golden! To treat the home (& his fur too! ), I’d recommend our Flea & Tick Control for Pets + Home. You would spray all indoor home surfaces including carpets, baseboards, pet bedding, sheets, sofa, etc. It’s also safe for your skin and clothing. Spraying the home thoroughly is recommend ideally twice within a ten day window, this will ensure you reach any flea eggs + larvae that may be hiding in your home. It wouldn’t be a bad idea to move any big rugs and furniture that will help you reach all areas and ensure a thorough treatment. Everything should be sprayed initially (except for houseplants!). It’s not necessary to leave the home after spraying. You can spray your pup’s fur as often as needed. Fogging is also an effective method as it creates a thicker denser version of the product which can get into more nooks + crannies. Often times, you can rent a fogger from a local hardware store- just give them a call first to ensure they rent non-thermal foggers (one that doesn’t create heat as the product is flammable!) We sell foggers HERE if you would prefer to invest in one. It is advised to leave the home for a few hours following the fogging, as the product would be quite potent + thick, and it wouldn’t be pleasant to inhale. I have pet budgies. Is wondercide pest control (indoor) harmful? Thanks so much for your question! Because birds have sensitive respiratory systems, we recommend removing birds from the area–or completely covering their cage–for about 2-4 hours during and after application to ensure the solution has totally settled. We hope this helps! Here’s a question. I’ve been working to take care of the fleas on my dog, and they have ended up being spread onto me. So my question would be, would it be safe to spray myself with flea spray? Because this is totally one experience I didn’t want to share with my dog. And if I can’t spray myself with fleas, do you have any recommendations on how to take care of them? Happy Tuesday! I hope that you are having a great week so far! Thank you so much for your question on our blog! Yes, you can use our Flea & Tick Pets + Home on yourself as a personal insect repellent. You can apply that as often as needed, but typically people only have to apply it every 3-8 hours. It will also work for repelling mosquitoes, ticks, chiggers, and many other pests that love to bite. You can also transfer the spray into a small travel size bottle to take it on camping trips or hiking trails. I hope this helps! Hi I saw your product on shark tank I have a long haired Siberian husky with a real bad flea problem I purchased your product off amazon and sprayed her today. She’s not scratching as much as befor but she is still scratching around her ears and neck (neck was a big problem area under the collar) my question is how long does it take to kill all fleas on her? With her coat being so thick it’s hard to spray directly on skin. Happy Tuesday! I hope that your week is off to a great start! Thank you so much for your question! I am sorry to hear that your pup is experiencing a flea outbreak! Our product will kill by contact, so typically they will be dead within a few minutes. Since your pup does have such thick fur, it could take a few thorough treatments before you see them completely eradicated. We do recommend using the product on your pup every 2-3 days, but it is safe to use on a daily basis. If you are noticing them itching in one particular place, you might want to pay extra attention to those areas when applying. It could be that the spray is just repelling them to that particular area. I hope this helps! -Can wondercide be sprayed on clothes and shoes and human skin? -Is it safe for human skin? of course I will do a small skin test first. -There are not many flea repellent products out there for human skin, which I think is strange. You should invent one! -Which product do you recommend for this issue? -Which series of products do you recommend for about 650-700 sq. foot apartment? Thank you for getting in touch with us and for your interest in our Wondercide products. Our company was founded to protect pets, people, and property without harsh chemicals, and we are eager to help you and your beloved Basset find a solution for those bothersome fleas! It sounds like you’ve really been working hard to get these fleas under control, and trying so hard to protect you and your pup. You can, in fact, spray your skin, clothes, and shoes with Flea & Tick Control for Pets + Home. We always recommend a test strip of the product prior to full body application. We also have a flea repellent that is labeled for human use, our Insect Repellent, which has the same formula as the flea & tick spray. We recommend our Flea & Tick Control for Pets + Home for inside your apartment as well. The Apartment Treatment Kit will treat your whole apartment and leave some leftover for spot-treating and using on clothes and shoes as needed. Follow label instructions for use, and make sure you are being as thorough as possible, under appliances, cabinets, wet dark areas, etc. As a local Austin business, we completely understand how bad the bugs here can be! We welcome you to come by and see us anytime. We would love to help you and your Wonderpup be successful in eliminating fleas from your home. We have a 30-day return policy on orders under $225 within the contiguous US. Let us know if we can assist with anything else. But I’m wondering if I’m understanding it correctly. Can these also be sprayed in my personal bed directly? If so, whats the guidance? Thank you for reaching out to us. Yes, Flea & Tick Control for Pets + Home can be sprayed on your personal bed. It is formulated for use on pets and around your home. We always recommend spot testing specialty fabrics before full application. Feel free to spray your pillows, your bed, your bed frame, etc. We recommend treating the home every 3 months for pest prevention, and you can also spot-treat your bed, any pet bedding, and high-traffic areas as needed. We hope this helps, but feel free to reach out to us with any additional questions. I wanted to know how often do you apply the wondercide for your lawn. How long does one application last? If you’re using our Flea & Tick for Yard+Garden/Outdoor Pest Control concentrates, we recommend treating your yard twice 7-10 days apart. After the initial application you can reapply every 30-45 days, or after heavy rain. Is it okay to use this product on gerbils that have mites? Our product is designed to be safe for most pets, including gerbils. We are pet parents too, and are here to support and help you and your furry friends be protected naturally. Because most small animals are more sensitive by nature, we strongly recommend testing a small amount of product on the back of the neck about an hour before a full treatment. We also suggest the 4oz size of Flea & Tick Control for Pets + Home for proper application on small animals. The smaller size is less intimidating, and produces a finer mist that helps to better control the amount of product being applying to such a small animal. Spraying the product directly into your hands and massaging onto your pet’s fur (instead of spraying them directly) is also a good way to apply the product, to avoid irritation of their sensitive respiratory systems. Please let us know if you have any additional questions Thanks again for your message!